The day after the March 11, 2011, earthquake and tsunami struck Japan, the city of Sendaishi, the capital of Miyagi Prefecture. 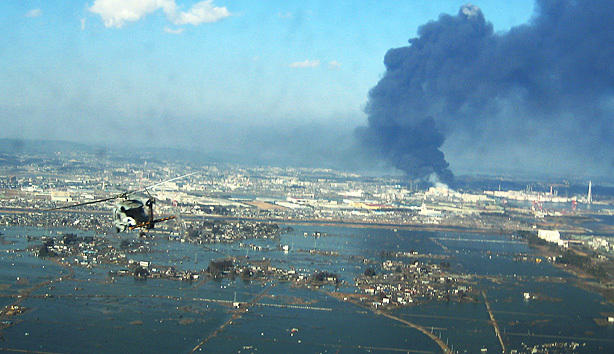 Photo by Official U.S. Navy Imagery. More than 100 Seattle Pacific alums were in Japan when the 8.9 magnitude earthquake and tsunami struck Japan on March, 11, 2011. With the help of Laila Olsen Sharpe ’73, associate director of alumni and parent relations, Response is offering the SPU community a place to share their stories and updates. Posted March 22, 2011, 11:24 a.m.
My family and I are OK; we have no damage from the earthquake. When it happened, I was at work in a small lesson room where I teach English to children. It was a very long earthquake, but I didn't think it was that devastating one. When I went home and watched TV, I was really horrified. It has been said for a long time that Shizuoka prefecture, where I live, and surrounding area are going to have tremendously huge earthquake sometime in the future. When it comes, it will be worse than this one. People have been sensitive and buying a lot of things we need in everyday life. It's hard to find rice, drinking water, toilet paper, and things like that at stores now. I heard that it's happening in Tokyo too. Maybe it's worse in Tokyo. Right now, as you probably know, we have a big trouble in Fukushima nuclear power plant. Now it's not just a problem of Japan, and other countries, especially the US, are helping us on it. I really hope and pray that things are going to work well. It seems to have been very difficult to do any works because of radioactive intensity. I've thought about things I can do for the people suffering and working in the area, in addition to giving money. I figured that prayer is the best thing I can do, and it's my responsibility too. It's nothing new; it's fundamental, right? Do you know of any SPU-Japan news update? Share it here in this moderated board.